The concept of human security is a new approach to security that focuses on the individual human being and provides policy alternatives to the traditional state-centred view, which considers the state to be the only and ultimate referent of security. Formally introduced into the United Nations system in 1994 the concept’s intellectual roots draw from international humanitarian law, human rights and human development, and since its introduction human security has been progressively integrated into the international security discourse. Mainstreaming Human Security: Policies, Problems, Potential paints a comprehensive picture of the relevance of the concept of human security in practice in a time of changing security paradigms and a challenging international environment. This volume looks at the practical implications of mainstreaming human security. 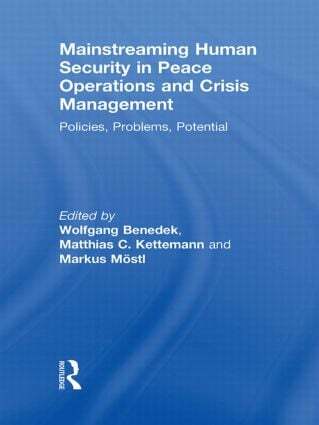 It focuses on the potential, problems and policies of human security in peace operations and crisis management operations of the United Nations and of the European Union. Topics addressed by the contributors include mainstreaming human rights and human security in peace and crisis management in general and the role of human security in the EU’s Common Security and Defence Policy, security sector reform, restorative responses to human rights violations by peacemakers, human security in Serbia and in African peace operations as well as proposals for human security training. The contributions to the book focus equally on mainstreaming human security in the UN and in the EU context. The global issues discussed and conclusions drawn are of relevance for the future of security addressed by peace and crisis management operations all over the world. Restorative responses to human rights violations by peacekeepers: Enhancing human security? Six years of mainstreaming human rights into the European Security and Defence Policy: A success story? The Civilian Response Team of the European Union: A European contribution to operationalising human security in international crisis management?